Sgt. 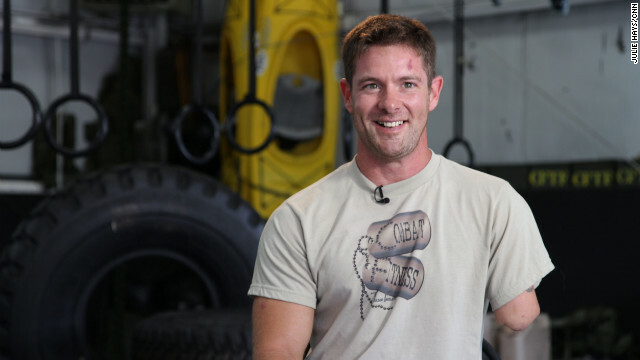 Noah Galloway, who is retired from the U.S. Army, says he still "trains like a machine." (CNN) - Noah Galloway's daily workouts could intimidate the most seasoned athlete. He runs, climbs, does pull-ups and push-ups, and lifts weights for nearly two hours at a time. But what really sets this 30-year-old father of three apart is that he does it all with one arm and one leg. In the aftermath of September 11, Galloway felt called to serve his country. At 19, he withdrew from the University of Alabama at Birmingham and enlisted in the United States Army. "After we were attacked, I felt like it was what I needed to do. I quit school and started off on a new journey." Galloway was deployed to Iraq with the 101st Airborne out of Fort Campbell, Kentucky, in 2003. After becoming a husband and father, he returned for a second tour in 2005. "They put us in an area that was known as the triangle of death. It was southwest of Baghdad. The units that had been there before us had taken a beating. It was just a rough area." Four months into his second deployment, he was trying to catch a bit of sleep between missions when his platoon leader woke him. "He said, 'Hey, we're gonna go take these Humvees to go pick up the rest of the platoon.' Said there's nothing important going on. We're just going to pick them up, coming back. Just wanted you to know we're leaving." But Galloway says he insisted on not only joining the convoy but driving the lead vehicle, a decision that put him in the path of a roadside bomb detonated by a trip wire. Four days later, on Christmas morning, Galloway woke in Walter Reed Medical Center in Bethesda, Maryland. "I had no idea where I was or how I got there. I remember waking up and seeing my parents walking in. I knew I was somewhere safe because they were there, and something told me to smile because they'd know I was OK."
He lost his left arm above the elbow and left leg above the knee. His jaw needed to be reconstructed, and his mouth was wired shut. His recovery was as rough emotionally as it was physically, and during it he and his wife divorced. "I remember thinking it was all over. I was very physical. I'd lost two limbs, a wife. You know, I remember thinking I much rather had died than wake up like this," Galloway said. His attitude started to shift thanks, in part, to a fellow amputee: his father, who lost his hand at age 18 when a machine malfunction at the plant where he worked. (CNN) –A Mississippi church that wouldn't allow a black couple to marry in its sanctuary because of the couple's race appears to be trying to right a wrong, as officials with the church's denomination decried the incident. Charles and Te' Andrea Wilson, regular attendees at First Baptist Church in Crystal Springs, Mississippi, were forced to relocate their wedding this month at the last minute. Their pastor, Stan Weatherford, made the relocation request on behalf of some congregants who didn't want to see the couple married there, according to CNN affiliate WLBT. Weatherford performed the ceremony at a nearby church. At services on Sunday, the congregation's leadership addressed the controversy in a statement read to the church. Editor's note: The 2012 presidential race is CNN Chief National Correspondent John King's seventh campaign. King is traveling through battleground states, where the election will be decided, to find the voters who will determine whether President Barack Obama gets a second term or if the country needs the change in direction that Mitt Romney represents. Philadelphia, Pennsylvania (CNN) - Paulette Beale shakes her head at the suggestion, then flashes a contagious smile. "It's still history," she says, to rebut the notion there could be less intensity for President Barack Obama in the African-American community the second time around. "The first history was that he won. The second history's that he won twice. So, it's not just about history the first time, you have to be concerned about the history for the next four years also. You can make history more than one time, you know." Her mother and father stand a few feet away, nodding approvingly. Paul and Altermese Beale founded Paul Beale's Florist 41 years ago. Paulette takes the lead now, but her parents are on hand helping most days in a shop that is an institution in the Ogontz Avenue area of North Philadelphia. "We love him," Altermese Beale says of Obama. "One of the proudest days of my life was the day he was elected." The Beales are determined to see the president re-elected, and are part of an Obama campaign ground operation that is active early because of several obstacles to generating the big African-American turnout that was critical to then-Sen. Obama's 2008 victories in many of the major presidential battlegrounds, Pennsylvania among them. Our visit this week was timed to coincide with the president's speech to the National Urban League. At that meeting, in New Orleans, a major topic of discussion is a new Urban League study suggesting that if African-American turnout in 2012 falls back to 2004 levels, then Obama is almost certain to lose North Carolina and would find things much tougher in a handful of other battlegrounds, including Ohio, Virginia, Michigan, Florida and Pennsylvania. In 2008, just shy of 65% of eligible African-Americans voted for president; in 2004 it was 60%. That prospect of lower turnout could change the math in some key battlegrounds even if the president runs roughly equal to his share of the African-American vote, an eye-popping 95% in 2008. (CNN) - Hurt. Devastated. Crushed. Those are words an African-American couple used to describe how they felt when they were forced to change the venue of their wedding because of their race. "Because of the fact that we were black, some of the members of the congregation had got upset and decided that no black couple would ever be married at that church," Charles Wilson told CNN on Sunday night. "All we wanted to do in the eyes of God was to be man and wife in a church that we thought we felt loved. What was wrong with that?" Charles and Te'Andrea Wilson had planned to marry this month at the First Baptist Church of Crystal Springs in Mississippi, but were asked at the last minute to move. Their pastor, Stan Weatherford, made the request on behalf of some congregants who didn't want to see the couple married there, according to CNN affiliate WLBT. He performed the ceremony at a nearby church. "This was, had not, had never been done here before so it was setting a new (precedent) and there were those who reacted to that," Weatherford told WLBT. "I didn't want to have a controversy within the church, and I didn't want a controversy to affect the wedding of Charles and Te' Andrea. I wanted to make sure their wedding day was a special day," he reportedly said.